Janssen’s Dosepak Equipment project is the result of the collaboration among Janssen Latina Engineering Department (the user), C-Matic srl (the Equipment producer), ECCT B.V. (the integrator), WestRock (Wallet and Dosepak supplier and producer) and Schreiner-MediPharm (the designer and producer of I-Smart Wallet), resulting into the design, installation and qualification of state-of-art equipment, first in the industry, which integrates advanced robotics and automation into a standard packaging process steps and enables lean, flexible and sustainable manufacturing. For a multinational pharmaceutical corporation, Schreiner MediPharm, in cooperation with Confrérie Clinique, developed a smart blister pack for digital patient compliance monitoring to enhance medication adherence by clinical trial participants. Employment of this electronic tool to manage and track processes during clinical trials marks a milestone for the pharmaceutical manufacturer. Janssen Research and Development, a Johnson & Johnson subsidiary, will launch the first clinical trial to use its iSTEP technology toolset based on Confrérie Clinique’s Mediccine Techonolgy, which employs smart blisterpacks and a patient-facing smartphone app, by the end of the year. In an interview with the Eindhovens Dagblad newspaper Confrérie Clinique’s director, Jos Geboers, tells about the progress that has been made over the last few years and the current status of Confrérie Clinique’s Mediccine™ technology, as he prepares to launch the product on the market in the New Year. Confrérie Clinique’s marketing director, Gerrit Menting, explains how ECCT’s smart package technology is being used to improve medication therapy adherence and to monitor the shelf life of the medication. You can read the complete article (in Dutch) here. Confrérie Clinique is currently implementing Mediccine™ technology on the high-volume production lines of 2 large pharmaceutical companies in preparation for mass production of Smart medication packages. Further details to follow. The research project, carried out by UMC Utrecht, the Sint Maartenskliniek, Nijmegen and Utrecht University, which made use of Confrérie Clinique’s Mediccine™ technology to keep track of the conditions under which medication is stored by patients at home, has been completed. The conclusion is that only 7% of patients monitored stored their medication in accordance with the advice from the medication manufacturer i.e. between 2 and 8 degrees Celsius. More than a quarter of the medication packages were stored at a temperature below freezing point for at least 2 hours, while the manufacturer of this medication specifically specify that these TNF-alpha-blockers must not be frozen. For further details (in Dutch) read the press release from the UMC http://www.umcutrecht.nl/nl/Over-ons/Nieuws/2015/Dure-reumageneesmiddelen-thuis-lang-niet-altijd-go. Pharmapack Europe is a conference & exhibition focusing on innovation in healthcare packaging & drug delivery. The 14th edition of Pharmapack Europe took place on 11-12 February 2015 in Paris. Jos Geboers attended and gave the well-received presentation “Adherence in the works: Microelectronics in-line commercial packaging”. Pharmapack Europe is a conference & exhibition focusing on innovation in healthcare packaging & drug delivery. The 14th edition of Pharmapack Europe will take place on 11-12 February 2015 in Paris. Confrérie Clinique will attend and present its innovative smart packaging solutions. 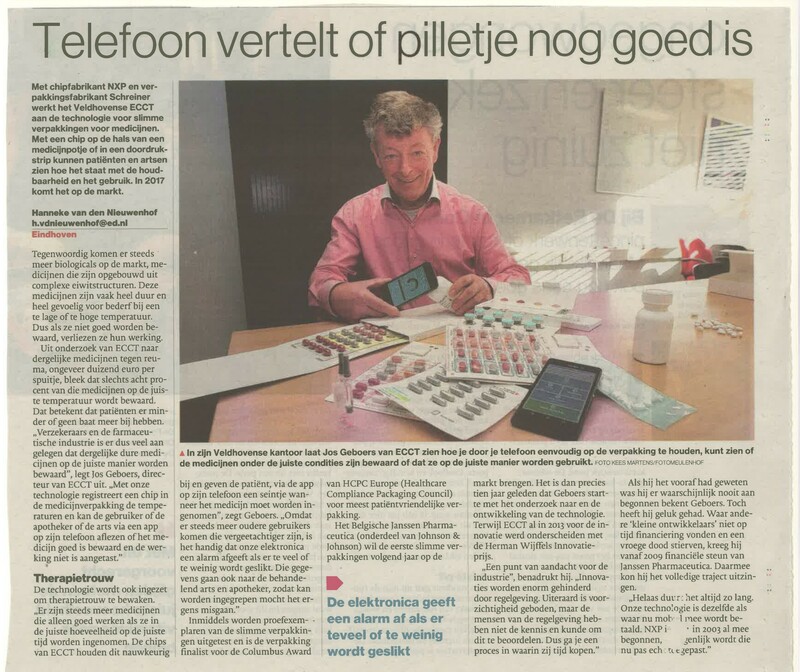 On the 24th of June 2014 an article appeared in the Dutch national newspaper, the NRC Handelsblad, highlighting the use of Confrérie Clinique’s Tempos thermochip in the fight against medicine wastage. Click here to read the article (Dutch). The wholesale distribution of medicinal products is an important activity in integrated supply chain management. The distribution network for medicinal products is increasingly complex and involves many players. New guidelines assist wholesale distributors in conducting their activities and the same principles apply further along in the supply chain to dispensing pharmacists. Compliance with these guidelines will ensure control of the distribution chain and as such help to maintain the quality and the integrity of medicinal products. In addition application of the guidelines will prevent counterfeit medicinal products entering the legal distribution chain. Click here to read an article (Dutch) written by Jan de Groot (Farmaceutische Groothandel Mosadex) about Good Distribution Practice. Confrérie Clinique’s Tempos technology is being used in a national trial aimed at increasing medication efficiency and reducing medication wastage. The trial involves 10 hospital pharmacies and 600 patients, and will be conducted over a period of 6 months. During the trial the patients will receive their medication from the pharmacy with the Safe-Rx card included in the package. When the patients return to the pharmacy for a refill the data on the card is read and stored in the Mediccinet™ database. This data is then analyzed to determine whether the medication has been stored correctly by the patient. Confrérie Clinique’s Temposcard temperature logging device wins the Herman Wijffels Innovation Award 2013. Confrérie Clinique’s development group, ECCT B.V., has won the prestigious Herman Wijffels innovation award, for the development of a system to reduce medicine wastage and to improve patient compliance using a sophisticated chip inside medication packages. To view a video about the award winning Temposcard click here. The Temposcard is marketed under the name Safe-Rx. Confrérie Clinique’s Temposcard temperature logging device nominated for the Herman Wijffels Innovation Award 2013. Out of the 743 ideas that were submitted to the Rabobank jury for consideration, ECCT B.V. was selected as one of the 13 finalists. On 7 November 2013 the award winners will be announced during an awards ceremony in Utrecht. For further details (in Dutch) read the Rabobank’s press release here. Confrérie Clinique signs distribution agreement with Eurocept B.V.
Confrérie Clinique has entered into an agreement with Eurocept B.V. for the distribution of its temperature logging device, the Safe-Rx. Confrérie Clinique’s Safe-T™ temperature logging device used in trial to reduce wastage of medication. On an annual basis an estimated 100 million euros worth of unused medication is returned to pharmacies where it is destroyed because it cannot be guaranteed that the medication has been stored under the correct conditions. The pharmacy in the St. Maartenskliniek in Nijmegen wants to reduce the amount of medication that is wasted. By handing out medication with the Safe-T™ card in sealed bags the pharmacist can determine whether unused medication that is returned has been stored under the correct conditions so that it can be handed out again to other patients. The trial with the Safe-T™ will take place over a period of nine months.